We got an email this week, and it’s the kind of email we love to get. It’s an email from Ben, who used Bristlr, and has had a lovely time. With his (and Lydia’s) permission I’ve shared his story below. Little did I know that when I created my profile that my life was soon about to change forever, very much for the better. It wasn’t long until I saw a face which really caught my attention. I remember seeing the picture of this girl and genuinely thinking ‘wow, she’s beautiful. I’ll click on that little heart and see what happens’. I genuinely thought that heart symbol would not turn red. I genuinely thought, just going by looks and her lovely sounding profile, that this girl was out of my league. Also, with me being in Stoke and the fact that she was in Leeds – surely nothing would ever come of this? This is a little while ago so I may not remember details correctly but I don’t think it was long before that heart symbol was a lovely, passionate shade of red. She liked me back. Then not much longer after that I received a message. It was a simple, succinct message that I’ll never be able to forget – ‘Why are you so far away?’. It was the kind of opening line that you want to receive on a website such as this. I took that message as her way of saying that she liked what she saw but would the distance between us be a hindrance? So I replied – ‘Ha! Why are YOU so far away?’. It was the only response I could think of and, looking back on it, could’ve gone either way I suppose! It could have been seen a a bit combative maybe? What did happen was that it started a conversation which I simply loved being a part of. As we spoke more and more, it was clear there was a fantastic connection between the two of us and eventually we exchanged numbers and took the conversation over the phone. It was in the New Year that we met up in person. This was after texting until stupid o’clock in the morning, calling each other and a Skype session in the month previous. There was always the danger that it wouldn’t work in person. I was really nervous and so was she but it was the best first (and last) date I ever had. I say last date because I am absolutely sure that I have found ‘the one’. We are now living together in Bradford and because of the move that I made I also now have a dream job as well as the dream girl. It may have only been a brief eight months that we’ve been together but we are both certain that this is it for us. The reason I’ve decided to get in contact with you is simply to let you know that what you have done, through your website, is brought two people together who otherwise would never have met. We often say that the likelihood of us meeting was so incredibly slim, maybe even impossible. So we believe that you have brought together two soulmates. You can call it fate or destiny (or the power of a great beard) or whatever you like but that is what’s happened. Everyone at Bristlr wishes you nothing but happiness together! 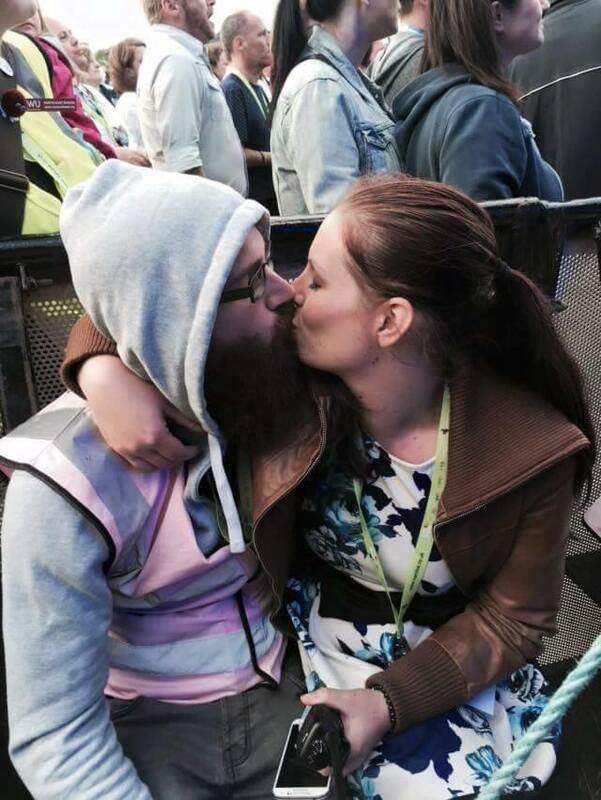 This weekend a beard fan messaged the Bristlr Facebook page to thank us for uniting her with the beardy love of her life. And what a wonderful story it was to read, made me feel all warm and bristly inside. So, here I am to share this wonderful success story with you, to brighten up your week ahead. Meet Sophie and Kyle. Notice Kyle’s EPIC beard, and those happy little faces. That’s exactly what we’re about here at Bristlr – making people happy. Now if that doesn’t sound like a fun night in, I don’t know what does! And it just goes to show, you could be on Bristlr and browsing beards within minutes! Meeting the love of your life couldn’t be simpler and more enjoyable. Feeling a little shy, Sophie boldly asked her pals to pick out the sexiest man they could find. Enter Kyle, or ‘Beyondtheflames’ as he was known back then. Sophie tells me from that point on they have been inseparable, spending every available minute together worshiping that epic beard. Their favourite activity? Cuddling up together and enjoying beardy snuggles. Aww! They’re even living together now and will be moving down to Newcastle together soon. Now if that doesn’t melt your heart, nothing will. We’re ever so happy you found each other, Sophie and Kyle! Do you have your own Bristlr success story? We’d love to hear about it, so get in touch!